Update: Iron Man 2 Gadgets post now up. Speaking of Iron Man movie, here are more added gadgets which I've seen from the movie. 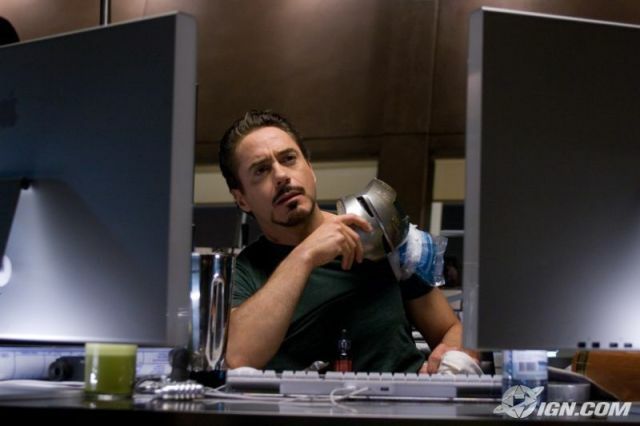 Looks like Tony Starks owns an Apple Computer in his workstation at home. When you look at the picture below, you can see the Apple logo just barely peeking from the monitor on the left side. Photo courtesy of IGN. I don't get it, Tony, so which one is it? Do you prefer Macs or PCs because from what I can see, your office computer is a Dell PC. The one pictured below is a Dell XPS M2010 portable pc. tony prefer both mac and pc.if you are expert u will use both Multi-User Operating System and computers.